Accepted 12 months in advance for active duty and 6 months in advance for all others. Reservations are suggested. Starts in March for the year. Can't check-in until after 1500hrs. Must use local General Delivery. 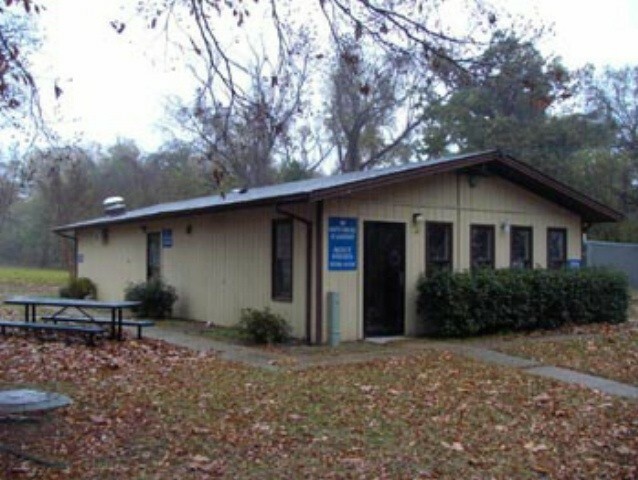 Campground office doesn't accept camper's mail or packages. Not allowed in cabins. Allowed in campground with usual leash and clean-up rules. Rates are $10 higher for DOD civilians. Historical & theme park attractions. 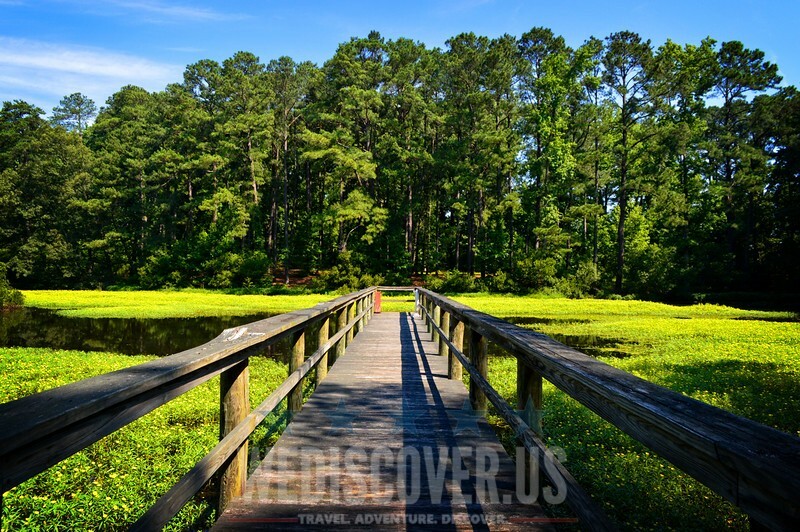 Cheatham Annex offers one of the best outdoor recreation sites in the Navy. It exemplifies the coexistence between the Navy mission and the environment. Our 2,300 acres of woodlands and lakes are home to white-tailed deer, raccoon, squirrel, cotton tail, beaver and otter. More than 150 species of birds live in our woodlands year-round. Do not be surprised if you spot wild turkeys, osprey, great blue herons, great-horned owls, swans, quail or pheasants as you vacation. Our three freshwater lakes abound with large mouth bass, bluegill, crappie and catfish, to excite even the veteran fisherman. 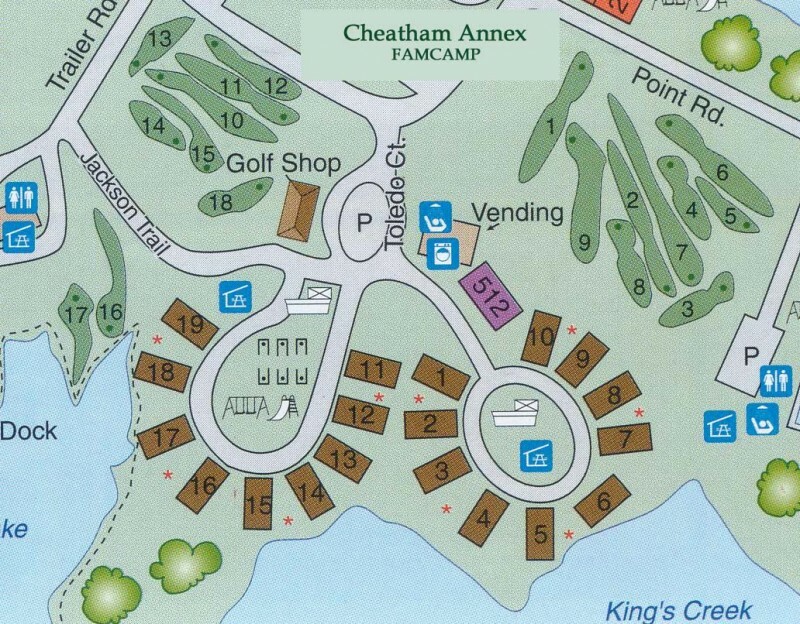 Map of the Cheatham Annex to the Naval Weapons Station Yorktown, with all outdoor recreation facilities and Navy Exchange annotated. We have stayed in the cabins at CAX Outdoors many times over the years, but this was our first stay in the RV park. First off, if anyone has a desire to visit the Virginia Peninsula/Tri-cities Historic Area, this is your home base. 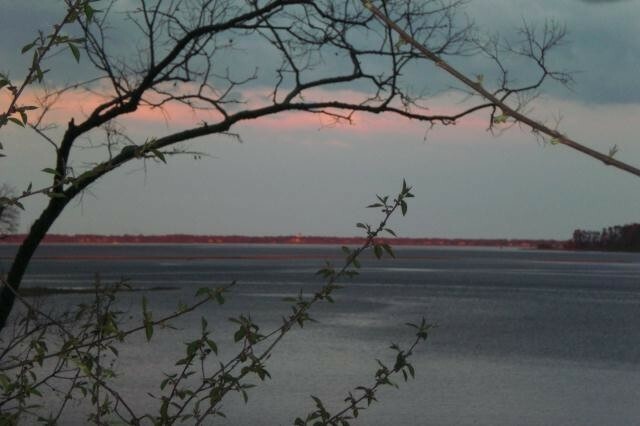 Located on the York River, you are only minutes from Yorktown, Williamsburg, Jamestown, Busch Gardens, Water Country USA and the cities of Hampton and Newport News. There is no other place as conveniently located. 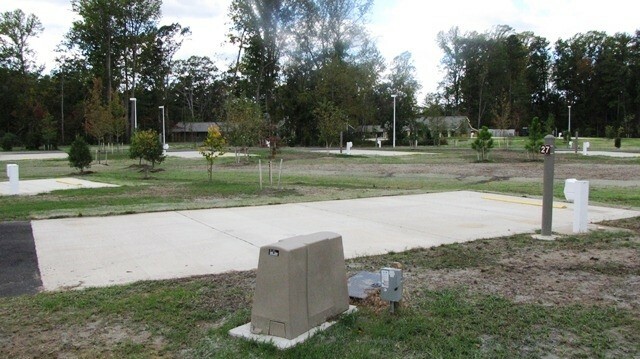 The RV sites are very well maintained with a concrete slab that has room enough for an RV and an additional vehicle. 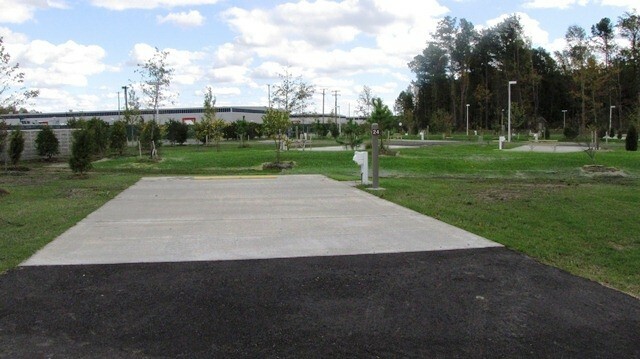 Each site has a picnic table and fire ring. There is a children's play set in the field next to the restrooms/bathhouses. The bath houses them selves are in good condition and everything worked. The only complaint with regard to the bathhouses is that they need a good deep cleaning and a coat of paint, particularly in the showers where the floor paint is almost completely worn off. 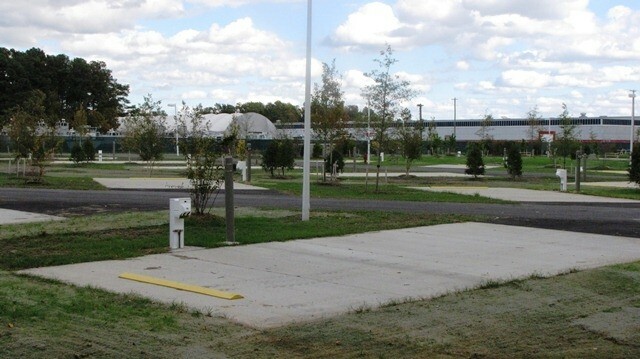 Regarding amenities on the base, there is a small convenience store/gas station on Sanda Rd, the main road, and there is a snack bar, 4th Street Grill, on 4th street just past the Navy Gateway Inn and Suites. CAX Outdoors/MWR also has an extensive list of recreational equipment available for rent. Aside from the issue that I mentioned with the bathhouses, The only other thing that bothered me was something that is one of my pet paves, that being previous campers to our site were smokers and obviously sat outside near enough to the fire pit to smoke and toss their butts in the fire pit, with no fire burning, so that there was a pile of their butts in the fire pit that they didn't bother to pickup before they left. I have no problem with people smoking, I do have a problem with inconsiderate smokers who leave their burnt up butts for someone else to cleanup. Which I had to do before I could build a fire to use to cook our dinner and no, I didn't want the flavor of their cigarette butts in my food. We will definitely stay at the Kings Creek Campground again in the future. 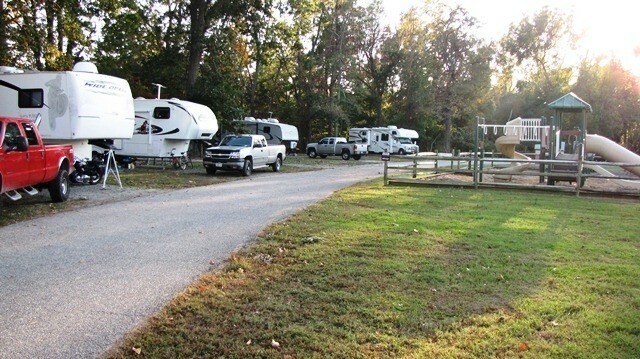 As this is primarily an RV park with cabins, and tent camping is a distant third offering, there are not many tent camping reviews. I am writing this review for any future tent campers to benefit from our experience. First, always book the "primitive" sites over by the RV park. Stay away from the w/e sites as they are rundown, tightly spaced, and oddly located right across from one of the golf holes. We wouldn't even camp there for free, much less the $20 they charge. But the "primitive" sites? So much better! I put word in quotations because there is nothing primitive about them, except for lack of electric hookup. But you have access to a potable water spigot and the restrooms are very nice (no showers that I saw.) We were at site 6 and it was spacious and level. No issue putting up two tents and a camp kitchen. And because this place is a well-kept secret, we had no other campers around us and we could be very *liberal* with our camp boundaries. Plenty of fallen wood on the ground for fires, we never lacked for any suitable firewood. Bring a hatchet for some of the larger fallen branches. Only a few cons that we found: 1. The streetlights are annoying while you're trying to sleep. If you must have pitch black, bring a tarp to put over your tent to block the light. There is really no way to situate your tent to not be exposed to a light. There is one about every 15 feet. 2. This is not a quiet experience. You're right by cabins and rv-ers who may be looking to party it up for the weekend. We didn't mind, but if you're looking for a truly primitive, remote getaway - this aint it. 3. Not a lot to do. We followed a trail and walked about a mile to the NEX mini-mart. We went to the fishing hole. We found a scenic spot. Other than that, expect to hang out at camp a lot. Nothing wrong with that, just be aware. Would we go back? Absolutely! Already planning a return trip. Great price, good location that hasn't been overrun. If you want to tent camp but don't want to be cut off from civilization, this is your spot. 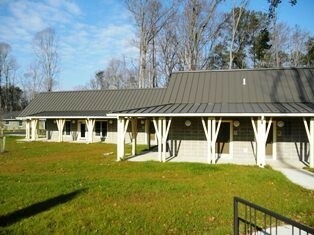 Great location near Williamsburg! Concrete sites, plenty of room between neighbor. Fire ring. Picnic table unusable because of wharped boards. Laundry very nice, but we were there 16 days and the broken washer was not fixed. Same with the shower. Who is managing the place? We called 3 times to pay for our campsite for the last half and no one would answer the phone. We left messages, no one returned them. Had to drive a couple of miles over to the office. Gowifi worked sometimes, usually not. The new campground would be great if those that ran the place would manage it better. Sad. This is a very nice campground. All back-in sites but with plenty of room between sites. 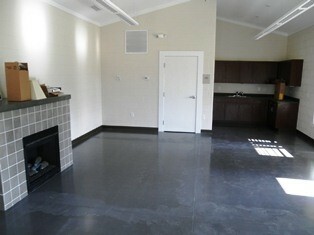 The facilities are clean. The Wi-Fi is basically non existent. Even if you can get on the signal is weak and drops off frequently. We were right across from a transmitter and the service was horrible. The cell service is just about as bad. Other than the Wi-Fi and cell service being bad this is a great place to stay. 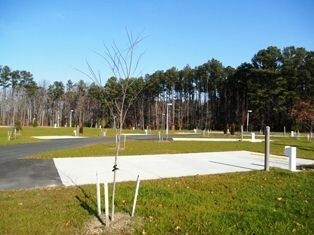 The most expensive military campground we have stayed at but give the options in the area it is not bad. There is plenty of room to walk the dog and there is a nice trail around Cheatham Pond. No internet, no WiFi, great price. Perfect for enjoying family time and not being stuck with a device in your face. The campground is quiet! The only thing you hear are air conditioners and bugs. I loved it! Close to Busch Gardens and Colonial Williamsburg. Good fishing on base. Pool and mini Nex are just fine. Easy access to the highway. 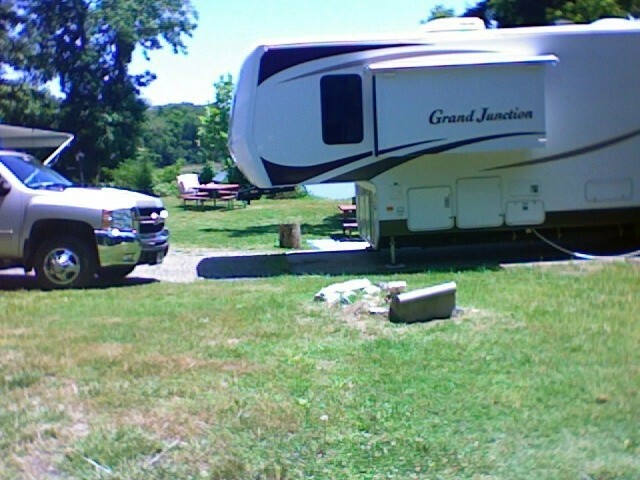 We stayed in a 42 foot fifth wheel and had no problems. Great location, large clean sites. Site #21 Would stay here again. WIFI is non-existent.. Cell phone reception was no better. I have always loved this Camp Ground. Quiet secluded and beautiful. However folks I do not think I will ever return in the heat of Summer. Why, little pests called mosquitos by the thousands. Ticks also. I was walking my 7 month old Cocker Spaniel who headed down one of the marked trails that I have taken dozens of times in the past, but always in the late fall and winter. Got near the foot bridge and the mosquitos attacked. Got out in a hurry. The next day we stayed on the roadway and walked around to the area used for tent camping and walked through to the pathway leading back to the restroom/shower facilities and again the mosquitos. I noted that there were three different camp sites in use and gone the next morning. Got back to the RV and the Mrs. helped remove ticks from the back of my body. We checked the puppy and found none on him. Don't get me wrong Cheatham is a wonderful campground facility. Just be prepared to have some type of insect repellent with you and use it before wondering away from your RV site. Will be back this fall or winter. We were there over Father's Day weekend and there was a load of fellow campers, but did not see or was able to chat with many of them since they were celebrating his day in Williamsburg or Busch Gardens theme park. The site I was assigned was not very level, but we carry enough leveling blocks to take care of this problem. Internet access was ok since we carry our own modem upgrade to enhance the reception. One night our puppy wanted to go out at around 3:30 a.m. to do his thing. Opened the door and a fox was right there. It looked at my pup who returned the stare then the fox took off across the street and turned back around and watched us for several minutes before heading into the woods. Like I have stated in the past, Wildlife galore. Haven't seen a black bear, but Virginia's Black Bear population is growing pretty darn fast. Great location for seeing the sights of Williamsburg. The RV spots are well shaded and spacious. Easy to back into and the restrooms are clean and well kept. The only down side is the internet is very spotty and there are no amenities on base besides a shoppette. What a great place! Tucked-away near Colonial Williamsburg and Busch Gardens. Very secluded. Clean and cheap. Great facilities. Big flat pads. All utilities worked well. Nice trails for walking the dog on. We didn't want to leave. 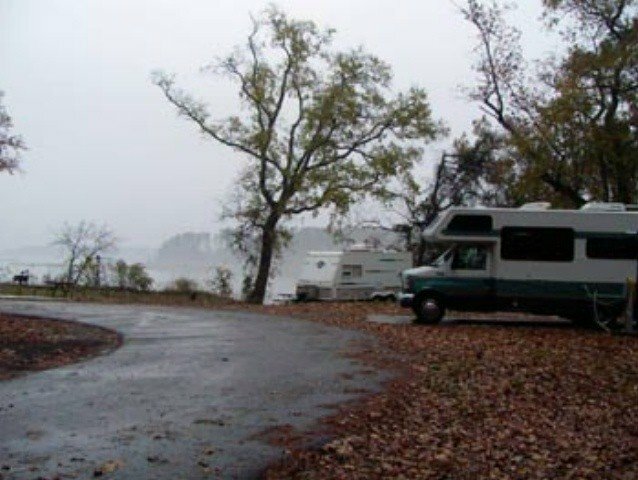 This was the first time we stayed here, the staff was helpfully..great, the first site we where given had a slope that was to much for my RV leveling system, they assigned me another site that worked out great. Everything was nice and quite. Great place looking forward in returning. 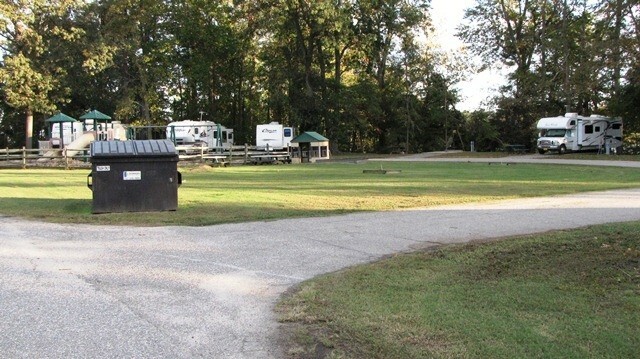 Very close to Busch Gardens, nice large level site, I have a 40ft fifth wheel with 3 slides and had plenty of room on both sides. Stayed here again during the first week of December 2016. We wanted to see the Grand Illumination in Williamsburg and do a little Christmas Shopping. As usual we got stuck in the Yankee Candle Mall. That didn't deter us for dining out. The wife followed up on meeting me at the Campground/RV Park the evening I checked in. Thank God we are from Richmond Virginia and that it only took an hour to get there. She left her ID Card at home on the table. Had to use my bike to peddle to the Main Gate and prove she was my spouse. Eventually, they let her in and I had to peddle my bike back to the RV Park. It was in the high 30s and my fingers were numb for quite a while after I got back to our RV. Not Funny. Earlier, I had stopped at a RV Center in Richmond and discovered that I didn't have my ID Card. I had left it at a storage facility on another military facility and that is where I lost my ID Card. Raced back to that location and no one had turned it in. Had to get a new ID Card. Luckily, the Pass and Tag office was still open. I was the last customer and they did not complain. So December 2nd did not start out all that well, but Cheatham Annex was so nice to get to. All my necessary paper work was waiting for me at the Main Gate. I had already had reservations for about two months and knew what site I was assigned. I always carry eight 2 X 10 X 12 inch treated boards for leveling the RV if necessary. I have automatic leveling at the push of a button, and the boards reduces the height the levelers have to go up to get the unit level. Actually, I have only discovered one pad that was really out of whack and always make sure that I did not ask for that spot again. It is easy to ask for the space one wants to use. 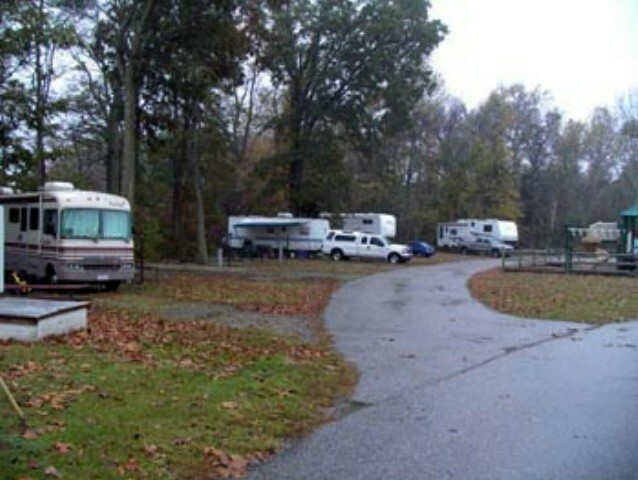 The RV Park has never been full at any time of the year. Hunting season for deer has a few more spaces being used for the season, but never to the point of having to worry about being able to get in. Found out why the digital locks were placed on the bathroom doors. It appears that some adults let their kids go to them on their own and the bathrooms were trashed. I mean trashed. It is now possible to determine who is responsible for trashing the bathrooms. I usually, ask for spaces on the front row across from the bathrooms and I have noticed that the staff and or maintenance personnel clean those facilities at least one to two times daily. I guess depending of the use of any assigned bathroom. I believe no one can complain about the service at Cheatham. The NEX Service Station/Mini Mart carries a lot of supplies for campers and the almost Class 6 Store inside should meet anyone's alcoholic needs. The staff there are super friendly and goes out of their way to assist you. We have Verizon as our cellphone service and have not found any dead spots on Cheatham Annex. We carry a Verizon Upgrade Modem to ensure that we can use our Laptops and IPADS without worry of someone hacking our financial information. No problems yet. We will be back to the Best kept secret in the Navy. Awesome place! Very clean and spacious with woods all around. The best place to stay if visiting the Williamsburg/Jamestown/Yorktown area historic area. Definitely will return! As always, love coming here and found everything to be above reproach. The Staff are courteous and friendly. I for the most part did not have to use the restrooms, but did have the occasion to enter one of them and found them to be very clean. There is now a digital lock on the doors to them. This added security made it more comfortable to use. Nothing wrong prior to the locks being added, but a woman did tell me she liked the added security. Makes sense since all the mess going on around USA in regards to men having access to women's restrooms. I took to the use of one of the hiking trails close to the Dumpsters. It is not on their facility maps. I took if for the exercise. Unless you like challenges don't take it. The trail ended on one of the gravel roads next to Queen's Creek. I still had a couple of miles to get back to the paved roads. Not bad, but I will do the trail again the next time I'm staying there. 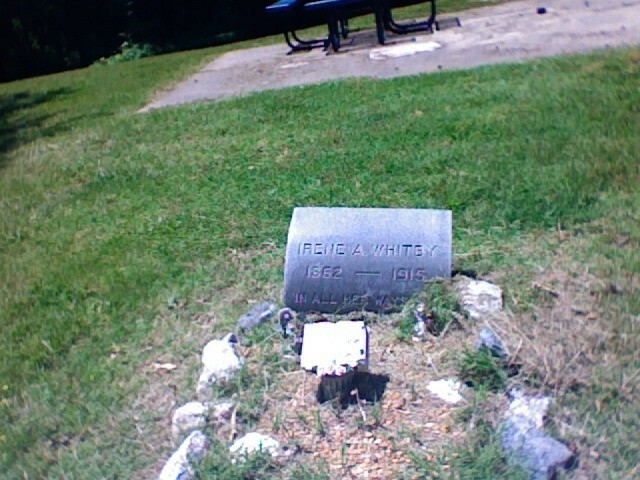 There were benches placed every so often on the trail. My Walk Fit indicated I took 26,753 steps to complete the trail. 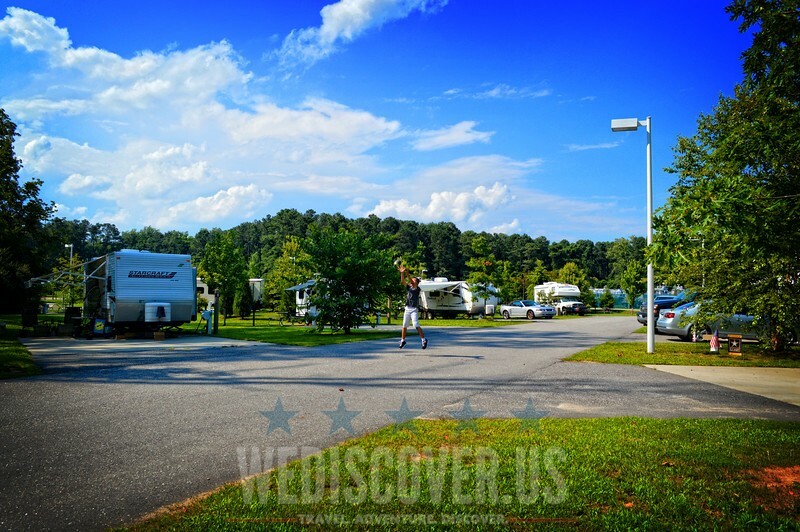 Kings Creek RV Campground is still the Best kept secret in the U.S. Navy. Found the MWR staff very courteous and helpful the grounds were well maintained and we spent three relaxing nights there. Definitely will be returning! Great RV campground. We stay here often. My earlier reviews regarding poor GoWiFi signal strength have been solved by purchasing an external WiFi antenna and USB adapter ($29 from www.ccrane.com) Much cheaper over time than upgrading our Verizon JetPac. However, keep in mind GoWiFi is not secure so best to use a secure connection like the JetPac for banking, on-line transactions, etc. The installed cable TV system is analog. Unfortunately, the cable provider has switched to all Digital. The MWR staff says a fix may be a long time coming so if TV is important you'll need a satellite dish. However, Digital on-air antenna reception is good for several local channels (NBC) for local news & Weather. Just got back home from another stay at King's Creek Campground. As always, I found everything just perfect. Excellent and willing service from the Staff. No problems with the GoWiFi service. Again we always travel with a Verizon Upgrade Modem. We also have a Verizon Jet Pack, but do not use it since purchasing the Modem last year. Clean restrooms/shower rooms. It did get a little nippy during a couple of nights. Its that time of year so we were ready for anything that may come up. We met up with friends from Florida who rented one of the cabins. They will be back. My wife and I will be returning next month for another stay. I've said this before, and will again. King's Creek is the best kept secret in the Navy. This location is the best kept secret in the Navy. I was stationed here 30 years ago and was amazed at the change. From an Annex of the Norfolk Supply system to that of NWS Yorktown. 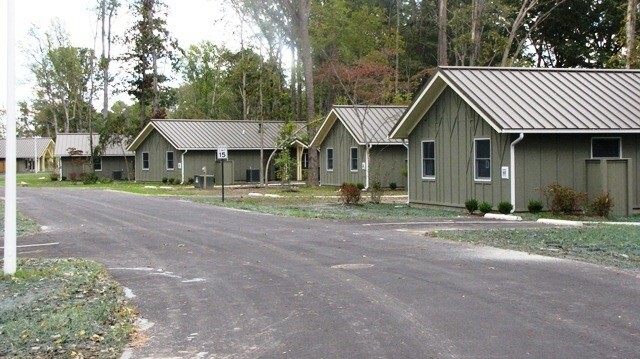 The addition of cabins of all sizes and RV sites that meets everyone's needs. Hiking trails, wildlife of all types, the security upgrades and patrols of Navy Police makes one feel safe 24-7. I had almost forgotten about the sounding of colors twice daily. I still love to hear them. I have read several complaints of the location. The facilities located close by to where we were assigned, includes a rather large lounge were always warm, clean, and private. The laundry Room met our needs. Recommend that one brings there own supplies for doing laundry. If you forget, the Navy Exchange located at the Gas Station does sell such. Had a problem getting level the first time we were there, but the attendant at the Check-in Cabin told us to find a better spot and let them know which one we picked. Didn't know how to get our three televisions to work and another camper assisted us and everything worked just fine. Our WI-FI worked just fine. We always travel with the Verizon Upgrade Modem. Such device provides additional security of ones system whether using ones computer or texting messages. We don't do this because of King's Creek, but because of our need for security wherever we are located or means of travel. Had to leave during a stay covering New Years and the first week of January 2016, our third stay here, due to the unexpected drop in weather temps and wife's problems we had to leave three days early. We were advised that we were not to receive a refund for those three days. No argument from me. We called in a few weeks ago to make arrangement for another stay. I brought up the reason for forfeiture of all the remaining days in January. The young woman said to wait and she checked it out. I did advise her that if I had to cancel within 30 days of our visit date we would have to only forfeit the fees for the first day or $30 dollars. I received an email confirming my next stay and noticed I was accredited two days from my previous stay that I had to forfeit. I have found that the attendants will do their best to assist you with any problems you may encounter. No one can complain about the location regardless of the time of year. Colonial Parkway, is just outside the main gate, goes from Yorktown to Jamestown. Williamsburg is close by. Shopping, Colonial Williamsburg and shopping there is also available. Restaurants offer you anything you may want. If you can't find one to meet your desires,stay home. Head towards Norfolk and additional sites one may want to visit are along the way or at Norfolk's Waterside. There is no place else in this Country one can stay for $30 a day and do so much, see so much history, or just relax and enjoy nature. I have use King's Creek on three occasions and have to say I have to rate the Park as 5s for each stay. Again, it is the Best kept secret in the U.S. Navy. We have camped here often. The much hyped Navy MWR GoWiFi over the past year has gone from poor, to bad to non-existent. MWR has had plenty of time to fix the system and have so far failed to do so. 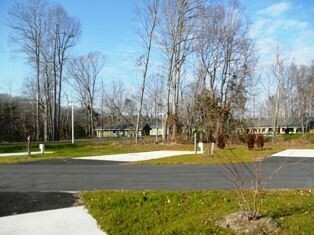 although it is the off season the campground appears unnecessarily shabby. If you come to visit and need internet service make arrangements with a commercial wifi service such as Verizon or a satellite service. Cheatham Annex has become an increasingly disappointing RVing experience. UPDATE: Initially when we arrived there was no Go-WiFi signal at our site which generated my earlier unfavorable review. I'm not going to "Walk Back" that review because when I asked about the lack of WiFi at the MWR office I was told (politely) that MWR at Cheatham had no control over WiFi problems or availability. 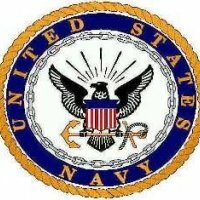 If I was having problems I needed to call Navy Go-WiFi Tech support (888-339-7150). My impression was MWR Cheatham had washed their hands of the park's WiFi system. Go-WiFi Tech support was very helpful and patient as we worked through the issue. It turned out there are two WiFi broadcast antennas at either end of the RV park. According to Tech Support they were both functioning normally. However, despite the fact our spot was only a couple of hundred feet from one of them the 5th wheeler in the adjacent slot was totally blocking the signal and the signal from the transponder at the other end of the park was too weak to log on. Recommended solution was to relocate. Instead I purchased a NEATGEAR high Gain WiFi antenna for my laptop. That improved the weaker signal and allowed me to log on. This is a long story but if you intend to camp at Cheatham and need reliable Go-WiFi try to get a site where you have line of sight to Bldg 599 (community center/laundry/showers.) The other WiFi broadcast appears to be located at the other end of the RV park near the dump station.